Description: Submit sitemap to major search engines like Google, Bing, Yahoo!, AOL, Ask, MSN, Altvista. Free sitemap submission to major search engines. Before, submission of your sitemaps to search engines, firstly, you should consider to submit your sit to search engines like Google, Yahoo, AOL, Bing & MSN. When you submit your site or blog to search engines, then search engines will start to index your sites When your sites indexed by search engines, it may take some search result ranking positions for your targeted keywords. The more you have quality content, the more rankings your site would get. Now, whenever you write new post to your blog, it doesn't mean that the search engines crawler will come up to your blog and it would index your blog post. The crawling rate is decided by the search engines. You have to wait for indexing the new content to search engines until the crawler reaches to your blog again. The one simple solution is submit your sitemap to major search engines by their webmaster tools so that whenever you published any article on your blog, they might be notify and index your article as soon as possible. Therefore, here is a guide to submit sitemap to major search engines like Google, Yahoo, MSN, ASK, AOL, Altvista & Bing. To submit sitemap to Google, you will have a sitemap for your website. 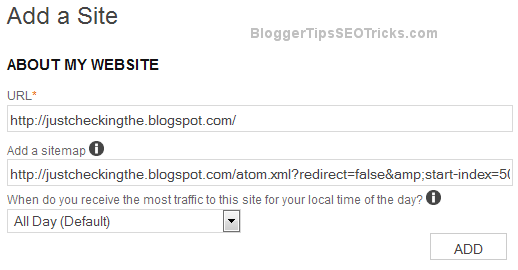 If you are using Blogger, have a look of Blogger default sitemap URLs. The default Blogger sitemap URLs will have the latest 25 post URLs. It means when you published 26th post into your Blogger blog, the Blogger sitemap still keep 25 latest post URLs so the oldest post would be removed automatically from its sitemap. 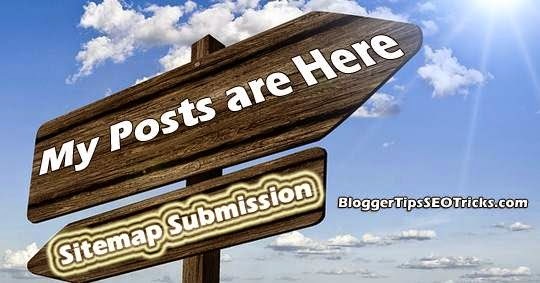 If you are using default sitemap for your Blogger into webmaster tools, the oldest posts excluding the latest 25 posts will not be present in your sitemap. You will always view 25 submitting URLs, and 25 indexed posts inside your webmaster tools. This is the common mistake to choosing the default Blogger sitemap URL. You may try any sitemap URLs mention above for your Blogger blog which have more than 25 blog posts. You could find the difference yourself. If you want to index entire URLs of your Blogger, use the following sitemap URLs. Before submitting your sitemap to Google, you have to verify your ownership for your domain to Google webmaster tools. To submit your sitemap to Google, go to Google Webmaster Tools and sign in with your Google account and follow the steps as the following preview. Click on 1. Add a site, 2.URL field and type your blogger URL. Finally, go for 3. Continue. Now, you have to very your Blogger domain ownership. Choose Add a meta tag to your site's home page under Alternate methods and 2. copy the meta code. Go to Blogger Dashboard --> Template(Under More options ) --> Edit HTML. Click anywhere on the Blogger source code, and press Ctrl+F to find <head> tag, and paste your copied meta code just below to <head> tag. Finally, save your template. Now again go to the owner ship page in Google and then click on Verify. If you have done all the steps correctly, then you will be verified by Google. Now, go to your Google Webmaster Tool home page and click on your blog URL for which you want to add sitemap --> Crawl (See left panel) --> Sitemaps --> click on ADD/TEST SITEMAP, type the following code. Now, click on Submit Sitemap. Once you done all these steps correctly, then your sitemap will be successfully submitted to Google. After some days, you can track how many pages currently submitted and index by Google via the sitemap. ** Note something about the sitemap code, start-index=1 tells to search engine that, there must be start indexing from the very newest post and max-results=500 means search engines will indexed upto 500 posts start from the start-index [newest posts --> older posts ]. You can also view a live example by using the following code into your browser. Make sure to change the blog URL with your blog URL. By using the above sitemap URL, you will see 3rd post from the newest post upto 7th post which is incremented by 4 from the start-index. *** Please note that the sitemap which I used for submission is only for the bloggers who have less than 500 posts. If you have more than 500 posts then no problem you can additionally add your second sitemap for indexing your posts in the future, by adding. Update: You may also use sitemap.xml too as it seems to have all the post URLs. The above code means that Google will start indexing of your posts from 501th post to the next 500 posts i.e., totally up to 1000 posts. If you have more than 1000 posts, then similarly you can add an additional sitemap in which you have to start your index as start-index=1001 to max-results=500, that is totally up to 1500 posts. ***Since AOL uses Google for organic search, so if your sites or blogs are being indexed in Google, then AOL will grab your blog automatically. If you want to submit sitemap to Bing, then you have two options for your sitemap submission, one is instantly which takes a little bit time, I would prefer to go with second option via Bing webmaster tool which takes some time, but you can know more about your site that how Bing treats with your blog or site. don't forget to change URL with your blogger blog in the above code. Now paste the entire code to your browser and hit enter. If you are successful, you will see a message "Thanks for submitting your sitemap". Now it will take some days for action. Sign into Bing Webmastool Tools. Type your blog URL, and hit on ADD site. Now, in the next window, you will have an option to add your sitemap during the verify process. I would recommend you to type your Blogger sitemap URL too. Just paste your sitemap URL, look on the above article and copy the suggested sitemap URL as you have used for Google webmaster tool. Finally, click on Add. In the next screen, you will have to verify ownership of the blog, you submitted. Bing gives you three options to verify your blog. 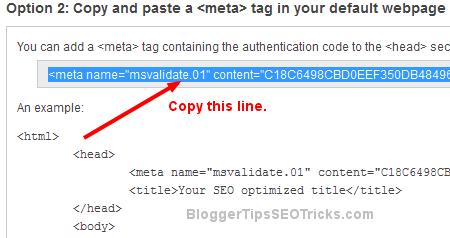 If your blog is hosted on blogger, you should use the second method i.e., Meta tag. Just copy the meta tag only as mention in the following preview, and don't close the window as we will use this window later. Now, paste this meta tag to your Blogger source code as you had done for Google webmaster tools. You may read again the above section for placing the code into your Blogger source code. Once you have place meta tag to your Blogger dashboard, now again go to the Bing webmaster tools page, and scroll down the page. Finally, click on Verify. If all is going well, you will redirected to the Bing Dashboard, where you will see your sitemap status 'SUCCESS'. ***Since MSN uses Bing for organic search so if your site or blog have indexed in Bing, then you would also see your blog in MSN, from 21 November, 2011 Yahoo completed algorithmic transition into Bing webmaster tool so if you submitted your sitemap to Bing, then you don't need to submit sitemap to Yahoo. Altavista uses Yahoo Search Technology for organic search so, you don't need to submit sitemap to Altavista too. Update: ASK doesn't have any submission feature to index your site in their search. Instead of it, you may add your sitemap URL to your robots.txt file which is also good for any search engines since all the search engines respect robots.txt rules. By default, Blogger has robots.txt file that also containing your sitemap URL too. If you want to view your sitemap URL, Just add robots.txt at the end of your homepage URL to view the document in your robots.txt file.